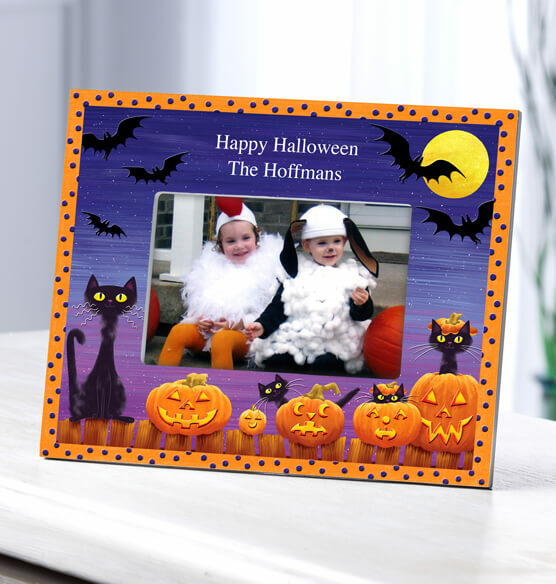 Scare up some good old-fashioned fun with this Cats, Bats and Boo Halloween picture frame featuring popular theme images. Black cats, flying bats and Jack-o’-lanterns populate a darkening sky background. Your personal message pops at the top in white font. Display a personal photo on a wall or table in the landscape or portrait position. Please bring back the old frames! I have been ordering these frames since 2005 and they are some of my most treasured possessions. Please bring back the old frames. These new ones just don't cut it! My family has made a tradition of these frames (Halloween and Christmas) for over 10 years. They look cheap. Bring back the handpainted frames! Not the quality they once were. The Halloween frames from previous years were beautiful hand painted frames. These are very cheap printed frames. So disappointed. Bring back the hand painted frames. Bring back the hand painted frames! So disappointed that they didn't learn from last years mistake of discontinuing the beautiful hand painted frames from previous years. I have been purchasing the Halloween and Christmas frames for 8 years now, but unless they choose to bring back the quality, I will spend my money elsewhere. Disappointing because I have enjoyed this tradition! Tradition. I get it every year. I collect these frames annually for our family halloween photo. Best place to get Halloween frames! Really need a 2016 Halloween frame. If you have one, please include it. I've been collecting the Halloween frames since 2005. Just wish Exposures would go back to the handpainted version - much nicer. This is better than nothing though. Have been buying them for years, but it looks like the quality has gone way down. This is probably the last time I'll order. 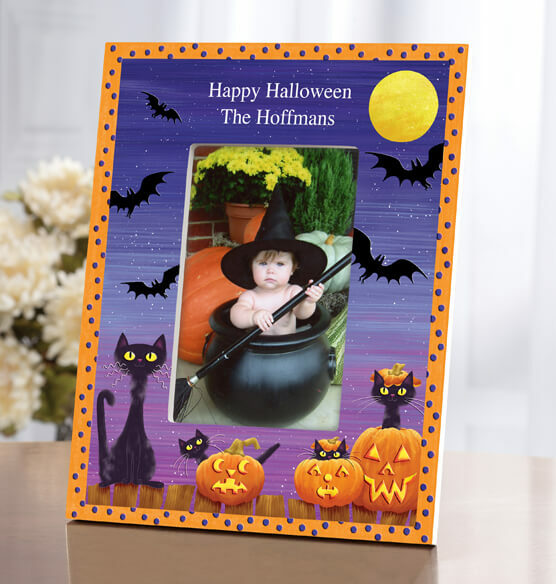 I love your Halloween and Christmas picture frames! I have one from when my children were young. Just love it! I've been collecting these frames since 2000! They are a focal point of my entry way each year. I love to bring them out every year and remember how everyone looked each Halloween. I have these frames dating back to 1995 when my first child was born. Love these! Does this already come with Halloween 2017 on it or do I need to include this in my personalization? are the two lines centered? BEST ANSWER: Thank you for your question. Yes, they are centered. We hope this information will be of help to you.